We’ll be working with two different files. 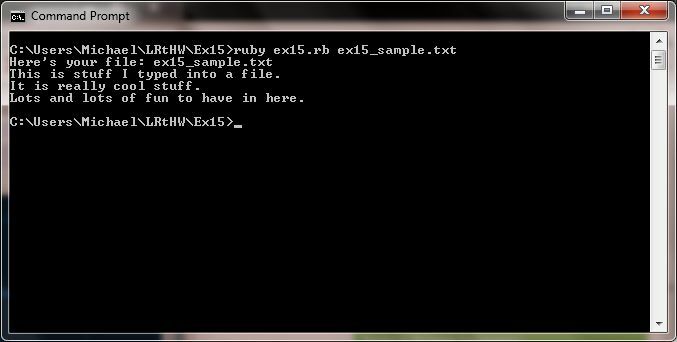 One is our ruby script (ex15.rb) and the other is named ex15_sample.txt. 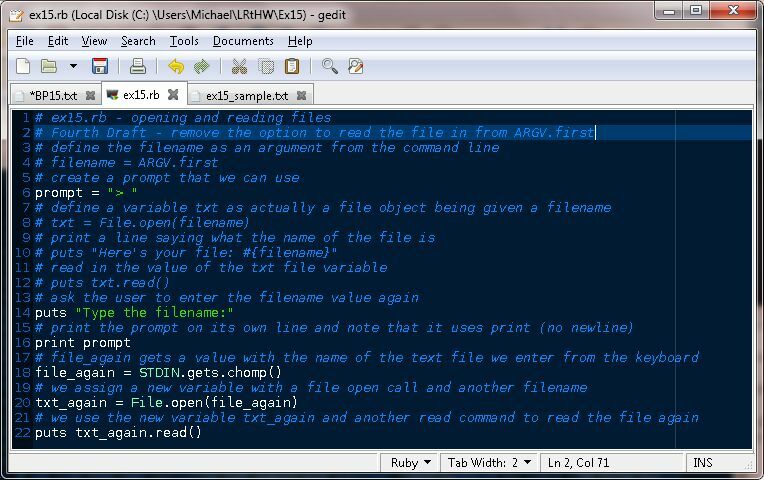 This second file is just a plain text file that we will read into our ruby script. Yep, that’s it. A little anti-climactic, maybe, but it’ll do :). So our goal is to open the file in our script and print it out. 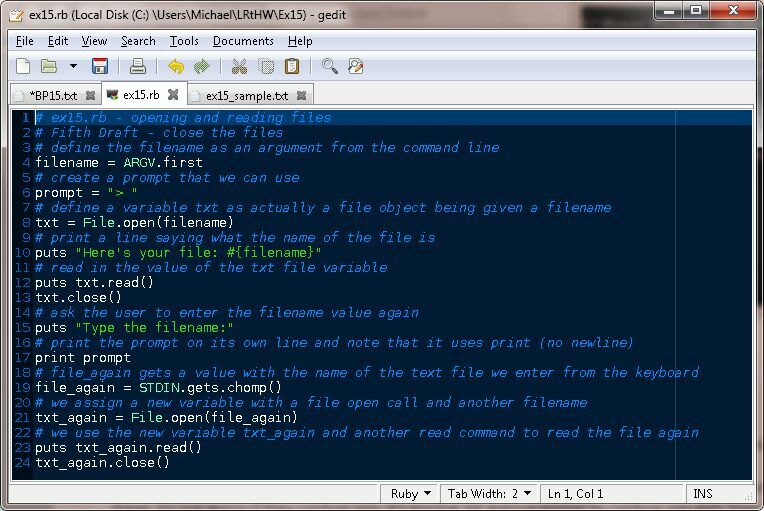 We don’t want to “hard code” the name of the file, though. 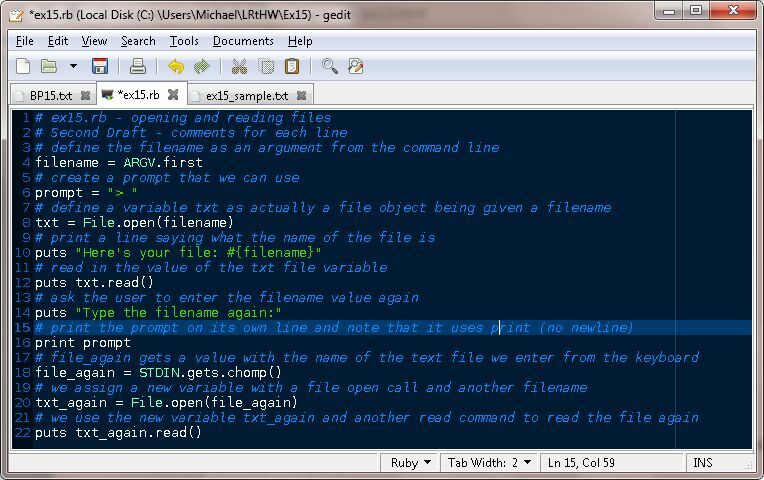 We want to read it from the command line. That way we can read in other files later. 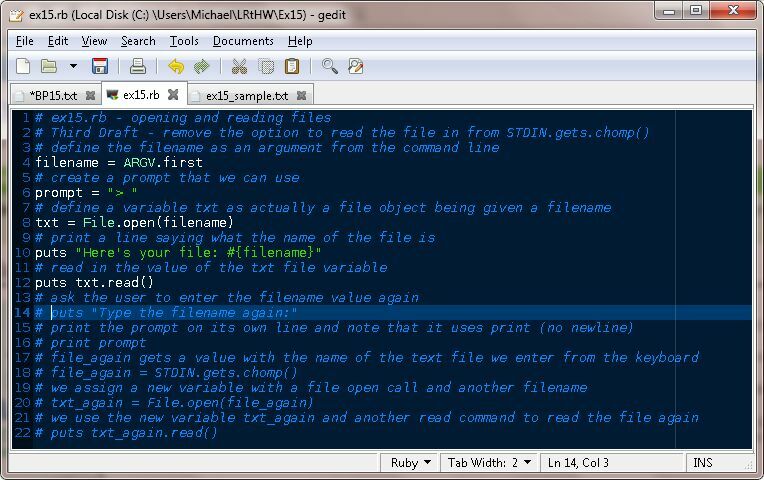 ARGV and STDIN.gets let us dynamically add the file we want to use. OK, there’s a bunch of new things going on in here. Line 7 does something interesting and something we haven’t done before. 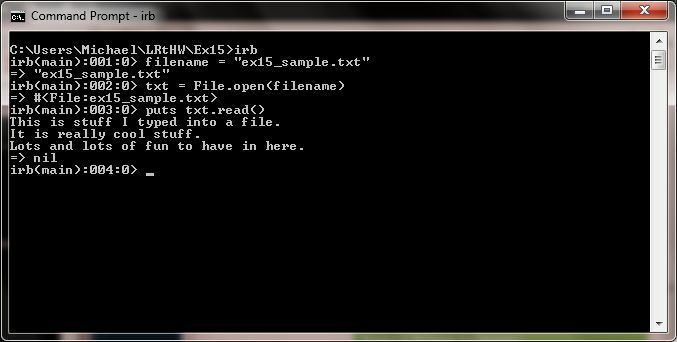 We are making an object of txt and calling the file.open option but using the txt label instead. If you are not sure ask someone for help or search online. 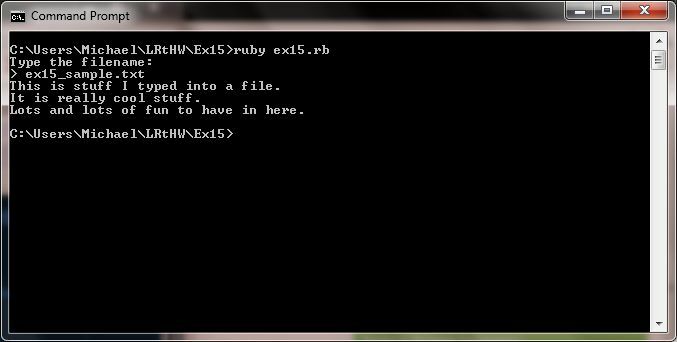 Many times searching for “ruby THING” will find answers for what that THING does in Ruby. 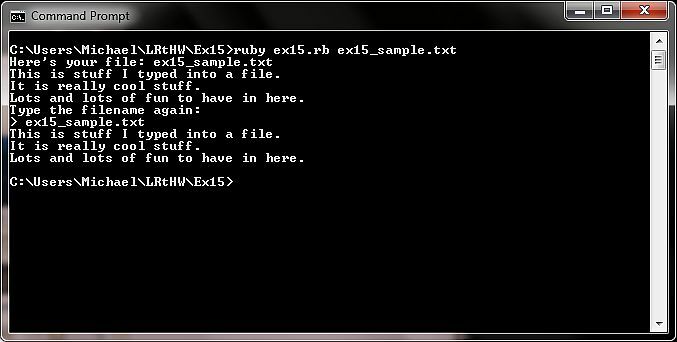 Try searching for “ruby file.open”. I used the name “commands” here, but they are also called “functions” and “methods”. Search around online to see what other people do to define these. Do not worry if they confuse you. It’s normal for a programmer to confuse you with their vast extensive knowledge. and that’s it. On my Mac, I got “Nothing known about File”. 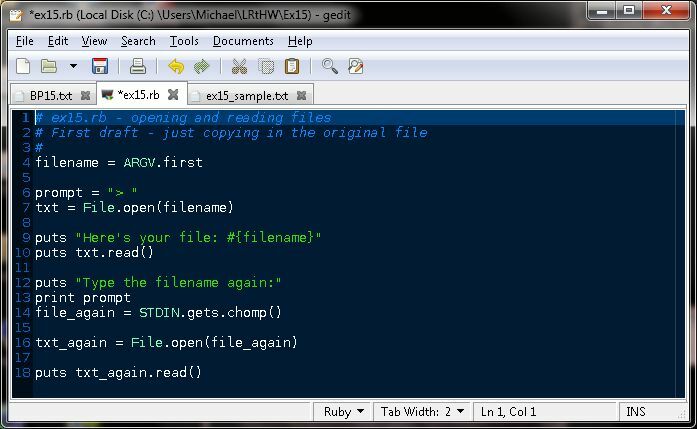 Have your script also do a close() on the txt and txt_again variables. It’s important to close files when you are done with them. So we have made a big jump here. It may not seem like much, but we have now opened up our scripts to the ability of interacting with files, both to read from them and, later, to write to them (come on, you saw that coming, I’m sure 😉 ). Having this ability means we can do things with our scripts that can be “hands off” from a human perspective. 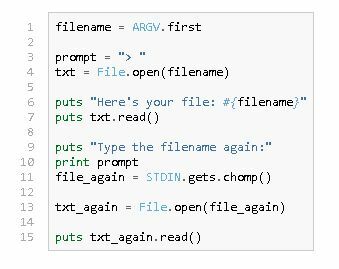 It also means that we can “pipeline” commands to our scripts via UNIX commands if we want to (granted, right now we’re limited to filenames, but the whole point of having ARGV in the first place is to feed variables to the script from the command line, or other scripts). This is helping move us along to scripts that can prove to be very useful.